What are the demands of playing county football? Being very focused and committed, training takes up a lot of time and it requires commitment. Itâ€™s hard to juggle college work, county and college football and a social life Do you feel as though it is worth it? Always, I complain about training most of the time but I donâ€™t know what Iâ€™d do if I didnâ€™t play football. Is it ever difficult to balance playing college football with county football? Yes, midweek training sometimes clashes but both sets of management are understanding with training loads. It is hard to train 3 or 4 times a week with college and then know you have to go home to train even more at the weekend! How is confidence in the College squad at the minute for the coming championship? We had a very good league campaign this year in Division 1 having won Division 2 last year. It is good experience playing oâ€™connor cup teams as the matches are very physical. We got to the semi-final having beaten Queenâ€™s and Sligo but lost out to a strong UL team. What are your countyâ€™s hopes for the coming season? We have new management in place this year and itâ€™s going to be a change, competition is high for places as there are new faces and younger players coming through from the underage teams which are all capable of starting for Waterford. We want to have a good league campaign and hopefully get back playing Division 2 football next year. Winning the Munster final is an obvious goal and hopefully have a good all Ireland series. Have you ever suffered a long-term injury and how hard was it to cope with? No, touch wood Iâ€™ll stay injury free this year! How do you think that support could be increased for ladies football? I think there needs to be more publicity in local newspapers, especially when home games are on. Also, even in news reports on television, nothing is ever mentioned about the ladies so maybe that needs to be put in place. TG4 are doing a good job with the coverage of the matches but maybe more funding needs to be put in place to promote the game. The ladies football teams throughout the country train just as hard as the menâ€™s teams but donâ€™t get half the recognition. How would you describe the bond that exists between you and your teammates? With county the bond is great! We are all good friends, we really push each other at training. At college we have a very close team, if anybody ever needs any help with college work there is always someone that will help. Some of my best friends play for IT Carlow and play for different counties so someday weâ€™ll be on opposing teams! What would you most like to achieve as a footballer? 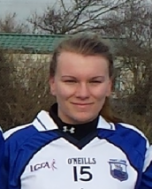 I would love to help Waterford ladies reach senior level. There are so many talented footballers in the county and there are a lot of underage talented players coming through the ranks. I wouldnâ€™t mind an all-star in the future either! Iâ€™d love to win the Giles cup this year with IT Carlow. It is a very tight competition and to win it would be great, especially with so many of my friends. Do you have a role model in football? Angela Walsh, I think she is one of the best footballers in the country. She has such a presence on the field, her work rate is top notch and is an all-round great player. Interests outside of football? We have horses at home and I love going racing. If there was a transfer market for players which player would you buy for your (a ) College Team (b ) County Team (c ) Club team and why? Jackie Kinch- a great midfielder and a good leader! What makes a good player? Having commitment, knowing what your weaknesses are and being able to improve them. What makes a good manager? Understanding the players, whether that be how they play, or the training loads, just knowing what all his/her players can manage. Also good communication is vital, having a clear plan and telling players what he/she wants from them for the team and up-coming year is important.